Preheat oven to 200C/400F Fan/ Gas Mark 6. Set up 3 bowls, the first with flour and a pinch of salt and pepper to season, the second with the eggs beaten, the third with the breadcrumbs. Spread the oil over the baking tray. Dip the chicken strips into flour, then egg, then breadcrumbs. Lay the goujons on the tray and cook in the oven for 20 - 25 minutes turning over half way through. Place the potatoes in a large pot full of water. Bring to the boil and simmer for 10 -- 15 minutes. Drain and mash. Season with salt and pepper if desired. As the goujons cook, chop up the tomatoes & add into the serving bowl. 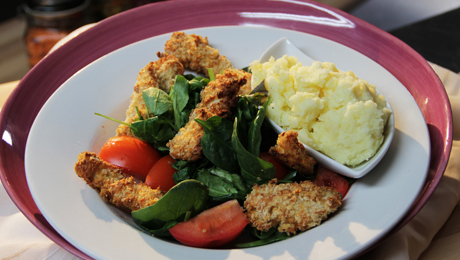 Remove goujons from the oven and serve with mashed potato and a side salad.